Westbuild’s range of Primers, Bonding Agents and specialty Additives will ensure maximum performance when used with the Westbuild range of waterproofing, levelling mortars and tiling systems. Multi Surface Prime & Prep is a one coat system designed to instantly prepare and improve adhesion of Westbuild tiling systems, waterproofing membranes, renders and levelling mortars to all difficult to adhere, non-porous surfaces. Westbuild PRO Multi Surface Prime & Prep can be used directly over glazed tiles, plastic, galvanized iron, zincalume and most metal surfaces to instantly prepare the surface ready to accept new coverings without etching or surface grinding. 15kg Pail (168-180m2 based on a single coat). General Purpose Primer is a multipurpose rubber polymer system designed to be used with Wet Area Waterproofing and Westbuild levelling compounds. 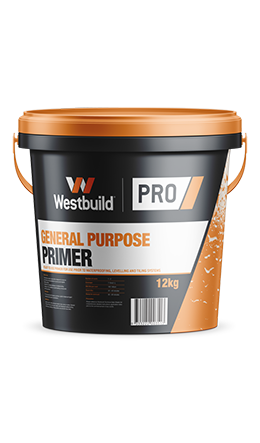 Westbuild PRO General Purpose Primer is developed to improve adhesion, reduce the formation of surface bubbling and promote maximum adhesion and coverage of the overlaying product. Flexible Additive & Fortifier is a multipurpose SBR polymer which may be incorporated in any cement based product to further improve the workability, durability, strength, adhesion, chemical and moisture resistance. Westbuild PRO Flexible Additive & Fortifier can be used in tiling screeds, tiling adhesives, building mortars and renders.